This is a short background blog which will support the release of my Fantasy Budget 2013-14, which will be part of Crikey’s Budget coverage leading up to the delivery of the Federal Budget on May 14, 2013. The topic of this blog is the estimated losses arising from persistent unemployment. Most people fail to associate on a daily basis how much the economy (and hence individuals and their families) forgoes in terms of lost output and income as a result of the government refusing to use its non-inflationary fiscal capacity to create employment. Direct public sector job creation was a very effective way of attenuating these costs and helped the private sector regain optimism. The tolerance of high levels of unemployment is a relatively recent phenomena and reflects the dominance of the neo-liberal ideology, which sees unemployment as a policy tool (to discipline the real wage aspirations of the workers) rather than as a policy target, which was the case during the full employment era (1945-1975 approximately). Now we tolerate high levels of unemployment without a clear understanding of the magnitude of costs that that policy position imposes on specific individuals and society in general. So already in this period of relatively better economic growth than we are seeing post-crisis, there were substantial losses being recorded both in terms of lost GDP (production and income foregone) and the additional personal and social costs that accompany persistent unemployment. While the unemployed and their families are certainly aware of these losses, the remainder of the society are less aware. For example, we might notice rising crime rates in our neighbourhoods but do not associate it with unemployment. In part, this is because neo-liberalism has changed the way we think about unemployment. In the past we understood clearly that it arose as a result of a shortage of jobs. In recent decades, we have been conditioned by a relentless government statements and a largely, co-opted media to perceive unemployment as an individual problem. Kmart Catalogues are highly motivated. The upshot is that we are lulled into accepting the popularised narrative that the unemployed are lazy; have poor work attitudes; refuse to invest in appropriate skills; are subject to disincentives arising from misguided government welfare support, and all the rest of the arguments that mainstream uses to obfuscate the social problem. In Australia, this sort of “blame the victim” approach was accompanied by a new and pernicious nomenclature that entered our daily public discourse and was promoted by government ministers including successive prime ministers. We were told that the unemployed were bludgers, job snobs, cruisers and worse. Television current affairs programs targetted unemployed families and lured them into looking as though they didn’t want to work (for example, remember the story about the Paxton Family, which represented Australian journalism at its worst). These narratives have persisted despite the overwhelming evidence from research studies in most countries that the unemployed are highly motivated to find work and are victims of a systemic shortage of jobs. The dominance of the neo-liberal ideology led governments in most countries to have eschew the adoption of policies of direct job creation to reduce the rate of unemployment and to minimise these massive costs. Fiscal policy became geared to the achievement of budget surpluses as some sort of token of prudent financial management. Employment policy shifted from a demand-side emphasis to a supply-side focus (active labour market) which targetted individuals with futile training programs divorced from a paid-work context and pernicious welfare-to-work rules. What was going on with respect to the deregulation of labour markets and the retrenchment of the Welfare State in the face of persistent unemployment was being mirrored in the approaches governments were taking to financial markets. The lack of oversight of the latter has been the fundamental reason we are now enduring the worst crisis from 80 years. Given the costs of unemployment are so large and irretrievable, one would think that at the very least direct macroeconomic intervention should have been a priority in these years – that is, direct job creation. While the previous work I have done on this topic has sought to compute the broadest possible measure of costs, in this blog I just focus on lost GDP income, which is the largest component of the total quantifiable costs of unemployment. In focusing on the foregone output resulting from unemployment and underemployment one has to decide a benchmark to measure the current situation against. A 2 per cent unemployment rate – which is closer to the true full employment unemployment rate than estimates of the NAIRU used by Treasury – see The dreaded NAIRU is still about! – for further discussion. 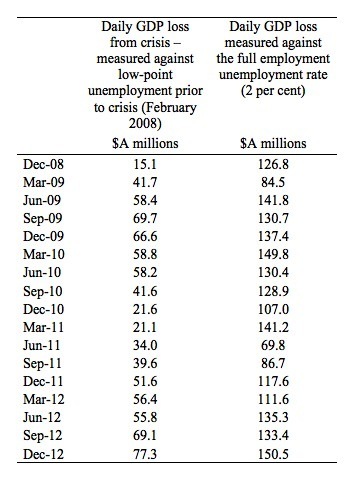 The low-point unemployment rate prior to the crisis – 4.0 per cent in February 2008 and the high-point participation rate prior to the crisis – 65.5 per cent. The high-point participation rate allows us to adjust the labour force to eliminate the cyclical decline that occurs in a crisis as the discouraged workers who stop looking for work are not counted by the Australian Bureau of Statistics (ABS) as being officially unemployed. Economists call these people the hidden unemployed given that they would work immediately if a job was offered to them. The use of the low-point unemployment prior to the crisis is just a convenience and does not presupposes that this level was a full employment state. In fact, at the onset of the crisis the ABS estimated that 9.9 per cent of the available labour force was either unemployed (4 per cent) or underemployed (5.9 per cent) on a seasonally adjusted basis. By any reasonable standards, when nearly 10 per cent of the available labour is being totally wasted, we are not in a fully employed state. The question being asked using this benchmark is: What are the daily GDP losses arising from the increases in the unemployment rate as a result of the crisis? In this case, we are computing the daily GDP losses that arise from the economy being away from full employment (that is, an unemployment rate of 2 per cent – the so-called frictional level of unemployment). The question being asked using this benchmark is: How has the divergence from full employment which has been exacerbated by the crisis impacted on daily GDP losses. I also ignore underemployment in this analysis. So the estimates that follow are underestimating the true costs of the fiscal austerity. I use the term fiscal austerity because even though governments are running relatively large (historically) budget deficits as a proportion of GDP, they are still inadequate to effectively deal with the unemployment and underemployment problem. Even at the low-point unemployment rate of the last cycle, the structural deficit was too small given that 9.9 per cent of available labour was idle. First, for each benchmark we compute potential employment. For the low-point unemployment rate benchmark this is conceptually the employment level that would have existed given population growth had the crisis not occurred. That is, we fix the participation and unemployment rates at the peak of the last growth cycle as described above. For the full employment benchmark (2 per cent unemployment rate), the potential employment level is the employment level that would exist if the unemployment rate was 2 per cent after adjusting the labour force for participation rate changes. Second, the potential GDP is estimated using the potential employment levels multiplied by actual labour productivity (real GDP per person employed). This series tells us what real GDP would have been if employment was at its potential level (defined above) and those workers were producing the average GDP per unit. Note that the concept of output potential does not mean the maximum GDP that could be produced. Remember that in this case, we have defined potential employment as the departure from the maximum achieved prior to the crisis. In the case of the 2 per cent unemployment rate benchmark, the full employment employment potential is more accurately thought of as the highest employment level one could attain given other parameters. Why use average productivity when it is obvious that the unemployed are typically drawn from the lowest productivity pool? Surely putting these people back to work will not generate average productivity per person. That is true but not relevant in this case. By using actual labour productivity series I am actually understating the production gains that would occur because it ignores the positive cyclical gains in productivity that accompany higher levels of activity. Third, the daily real GDP losses are expressed in terms of millions of dollars per day by dividing the gap between actual and potential real GDP by the number of days in each quarter. 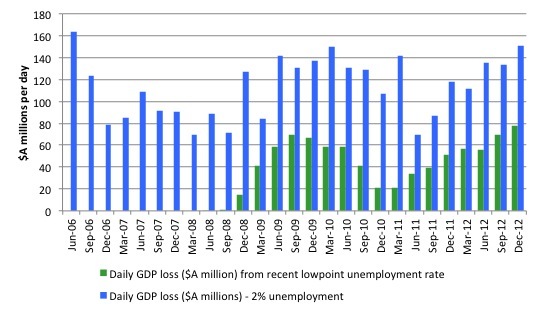 This approximates the daily loss (never to be regained) in real income that is foregone by allowing unemployment to remain either above the level that was achieved immediately prior to the crisis (in US and Australia) or in the second case for Australia, by allowing unemployment to depart from its true full employment level of 2 per cent. The first estimates (deviations since the start of the crisis) understate the true costs by a greater margin than the second estimates for Australia (the departure from full employment). Table 1 shows the estimated daily losses from the December-quarter 2008 until the December-quarter 2012. Relative to the recent best unemployment rate period (February 2008) the Australian economy sacrifices $A77.4 million in lost national output and income every day as a result of the Government’s failure to attack the unemployment problem. Relative to what would be a fairer representation of the true full employment unemployment rate (2 per cent) the Australian economy is foregoing $150.5 million in lost national output and income every day. These losses are what economists call deadweight losses – they are never recouped. We allow the government to deliberately suppress economic activity as they pursue their obsession with achieving a budget surplus and the costs to the community in terms of lost income are massive. This is the cost of our neo-liberal policy obsession. It would be impossible to justify that scale of loss by any reasonable standards. It is also important to remember that these estimated income losses understate the true cost of the policy failure in allowing the unemployment rate to rise in the current crisis and also maintaining a fiscal regime that has stopped the economy achieving full employment. Phase 1: the rising costs as a result of the onset of the crisis – through to September 2009. Phase 2: the positive impact of the fiscal stimulus packages in reducing the costs – from late 2009 through to early 2011. If the Government had not become obsessed with pursuing a budget surplus and instead allowed the deficits to support the emerging real GDP growth, the costs would have dropped to zero by this benchmark by the end of 2011. Phase 3: the fiscal policy austerity associated with the budget surplus obsession. The Government is claiming that the slowdown in real GDP and the rise in unemployment is being caused by the deterioration in international conditions (drop in terms of trade etc), which has curtailed investment in the mining sector. While there is truth in that claim, it indicates that this was no period to be trying to pursue a budget surplus. As non-government spending slowed, the government deficit should have been rising not falling. Fiscal policy design has to be conditional on what the non-government sector is doing. The Australian government has been exacerbating the slowdown in private spending, whereas in the stimulus period it partially offset the decline in non-government spending, which was appropriate. The apparent failure of neo-liberal supply side policies to reduce unemployment prior to the crisis is now highlighted during the crisis. There is now an urgent need to address the large pools of unemployment in world economies. There is no financial reason why the Australian government should not deal with this problem directly by introducing a Job Guarantee. If the Government had the political will, it could readily overcome the problem of persistently high unemployment. The SW (Cornwall / Devon etc) may be experiencing a tourism shock. Northern Ireland is well Northern Ireland………..but transport stats that I follow closely is very different from down south where more people probably remain inactive as they slowly turn off from life. Bill Mitchell is the only contemporary “capitalist” economist I know of who takes such a strong and central positive stance on full employment. By “capitalist” economist I simply mean here an economist working in the capitalist or mixed economy tradition and not taking an avowedly or overt Marxist stance. Even the best and most enlightened of other social democrat economists have not taken or are now no longer taking such a strong stance on full employment. The other thing I notice about Bill Mitchell is that he is far more empirical and historical in his approach to economics and far less theoretical and ideological than all or most other “capitalist” or “bourgeoise” economists. That is to say, his analyses are far more marked by recourse to and analysis of empirical data and to considering social and economic history in its entirety. I put “capitalist” and “bourgeoise” in quotes as Bill Mitchell is not on any measure a mere or standard capitalist or bourgeoise economist. However, I cannot call him a Marxist economist either. Bill seems to have little to say on capitalist ownership per se but I might have missed those blogs. Ignoring or tolerating unemployment is the mark of the unempirical and ideological economists. That is to say, ignoring unemployment and all the personal, social and economic damage it does requires not merely callousness but also an intellectual incapactity marked by the ignoring of empirical evidence and the adoption of prejudicial ideological and belief-based stances. The data in table 1 swings around quite a bit. For example the change from Dec 08 to Mar09 is a large increase in list productivity (against the low point bench Mark), and whereas the inverse is seen for the 2 percent benchmark. Is this because the participation rate is fixed for one and not the other? Is it possible to see the rest of the data?